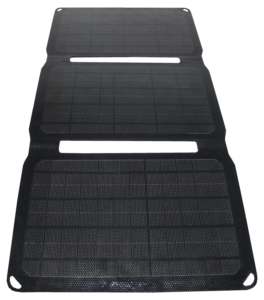 The POWERplus Gorilla is a portable foldable 3-panel solar cell with 5V/3A max. USB output and 14.8 DC output. The Gorilla comes with a female cigaretteplug which can be connected into the DC-in. The solar cells are rated 20W, which provides an average effective output of 14W in sunny conditions.